Shakira is a wide, level, very correct daughter of our Deja Vu and Foxwood Popovi Da, a grandson of Paisley. 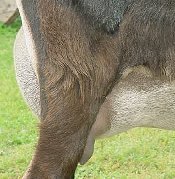 Shakira freshened with an absolutely gorgeous udder - the closest thing to Meringue's that I've seen. Needless to say, we are thrilled, as the beautiful mammary added to the power and size comprise a complete package. We again bred Shakira to Dauntless in hopes of finally getting a doe kid from her. 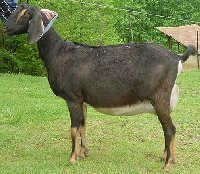 Shakira has produced magnificent bucklings who are off doing their jobs with several herds. But we wanted a doe kid from such a lovely, productive lady. Well fooooooo - she did it to us again - 3 handsome bucklings. Shakira and two of her buck kids were sold to Theresa Russel of Heiskel, Tennessee. 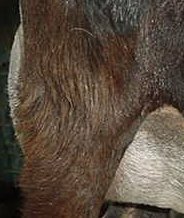 The other buckling joined one of Ashura's doe kids in the herd of William Gilliam of Grandview, Tennessee. Thanks so much everyone. For more information or a hardcopy brochure, e-mail us.